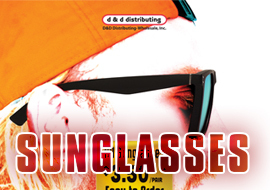 D&D Distributing is an importer and manufacturer of toys and fashion accessories. 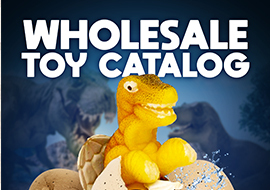 We strive to provide the perfect toy and gift selection for your company. We’re committed to quick and efficient service, with low minimums and prices to serve you and your business. Crystal-clear painted ornaments look and feel like glass. Each stretch bracelet includes 6 shimmering ornaments matched with festive metallic beads. Our new hatching toys contain a magical surprise. Excitement builds as the eggs crack open, and reveal a new member of the family. Leave it in the water and it will grow to full size within a week. Take our Wind-up Unicorn Glider on a flight of fancy. That’s right, the introduction of the mini blinking ornaments were a big hit last year, inspiring us to create many new and exciting designs for 2018. Choose from Puppies, Kittens, Little Birdies, and Barnyard Babies. Easy To Order, Easy To Sell! All sunglasses are one price per pair. Except Polarized styles. Minimum order 1 dozen per style.